Nothing weird happens if the ball leavers center. You do strive to be coordinated, but there are times you want be be out of center. A centered ball means your nose is into the relative wind. The ball slipping out of center when you start a turn but then returning means you want to change how you initiate a turn. You probably want to think 'lead with rudder'. The other clue is your implication that in case of an emergency collision avoiding turn you would initiate with full stick (making the ball completely leave the cage). You want to rethink this. It takes 'yank' to bend your flight path and its best done with your nose in the wind. An emergency turn that initiates per your description sounds like an initial change in attitude (bank) throwing the ball out fallowed by getting your nose into the wind, still mostly an attitude change till you pull back on the stick. For an emergency turn think yank and bank with a centered ball. The steeper the bank the more you can pull back and the faster you will turn. The proof is in rate of turn and how long it takes to get there. How many degrees can you turn in the first second and how many degrees / second can you achieve after that? The mindset of leading a turn with rudder will get you killed. I know people often say that, and I know I have been guilty of saying it too. I had this discussion with a glider CFI/DPE this past Summer. Leading with rudder is the same control input you use to enter a spin. What you really need to learn is how much rudder you need to apply to compensate for adverse yaw. You are better off to use to little instead of to much, especially if you are near stall speed. The airplane will turn even if you don't use the rudder, it is just not as nice feeling and as efficient. The mindset of leading a turn with rudder will get you killed. It is not even a little bit difficult to initiate a turn in a CT without slipping, he could and should learn it. talk about getting killed, if you can't execute a normal turn and don't understand an emergency turn there you are setting up to getting killed. You might need to turn immediately and knowing how is step 1. The CT has a big effective rudder, and doesn't need much. I find when I enter a turn I just put a little pressure on the pedal, not really a "press" of the pedal. The CT (especially the CTSW) is also pretty "tail happy"...small gusts, turbulence, and similar effects tend the knock the tail around and disturb the ball. When that happens, it's often helpful to just keep the ball "mostly, kinda" somewhere in the middle, instead of chasing the ball around and trying to keep it perfectly centered. You'll fail at that and just give yourself a headache. I don't know what it would take to actually spin a CT, but based on my experience it would have to be a gross mismanagement of the controls. It's very docile and predictable. Ed, I know you said "think". I do quite a bit of instruction, so my perspective is a little different than yours. I don't think it is over the top, because I get to ride with people who are thinking lead with rudder. They tend to over apply the rudder causing a skid to start a turn. It is much safer to start a turn with a little slip from not using enough rudder, than starting a turn with a skid from using to much rudder. A skidding turn during slow flight or if you get to slow on approach is not a good thing. I do agree that a turn should be made properly. The best way is with simultaneous application of the correct amount of rudder to overcome adverse yaw do to aileron application. It is, until it isn't. I have had a CTSW break and point the nose towards the ground twice. When it happens it is very abrupt. Both times that it happened were with 40° flaps. Tom, the op has awareness of loosing his centered ball initially, if he thinks 'lead with rudder' the objective is to keep the ball centered when initiating the turn and if he over-does it he will notice the ball now losing its center due to skid. If he sees one and tries to fix it he can see the other and not overdo it. If you already think simultaneous application and you get a slip then what's the fix? The fix is in the direction of leading with rudder. I agree, when it happens it is very abrupt. I have had breaks at reflex flaperon setting. A sharp drop is just a strong stall, the nose dropping toward the Earth is not a spin entry unless there is rotation as well. Is that what you meant? I have only had a wing drop one time my my CT, at full flaps and low speed, while trying to provoke a sharp stall by pulling back aggressively on the stick. It was pretty gentle and easily countered with a little opposite rudder. I get what you are saying, but I stand by my point that getting to the point of an incipient spin unintentionally is a gross mismanagement of the controls, especially in a CT where the margins are so broad. If alarm bells are not going off in your head before it happens, something has to be seriously wrong with your training and/or technique. "it is until it isn't" is pretty much true of anything. Fire isn't dangerous until you light your cigarette while you are soaked in gasoline. Motorcycles are perfectly safe until you run into something. A CT is very predictable and docile until you do something bone-headed and exceed the flight envelope. Satisfactory trimming is accomplished with minute pedal inputs. After getting experience with the CTSW, trimming, even in turns, becomes almost second nature. As Andy alluded to, it is not necessary to keep the trim ball centered exactly, but just close to it. As proficiency is gained, the airplane can be flown almost by “the seat of the pants.” I do not recommend fixating on the trim ball. Keep your eyes outside. The CTSW flies like a little sports car. Anyway . . . that has been my experience. YMMV. Yes Andy there was rotation, which I stopped almost immediately. Once with someone else flying the airplane during a checkout, and the other I was flying on a very rough gusty day. Both times it happened were straight ahead power off stalls with 40° flaps. generally the airplane is very predictable, but every once in a while it will bite. Personally I don't call practicing stalls bone-headed, or exceeding the flight envelope. I generally do a pretty good job with keeping the ball centered, so much so that I have had students ask where the switch for the ball was located. The only way to get an abrupt nose down in a stall with out the spin entry would be from a whip stall. Ed, my points come from teaching. I used to use the term lead with rudder. Students tend to use way to much rudder when starting a turn when told this. As I have gained experience I would rather a student use less rudder than needed and add rudder as required instead of using to much to start with and having to take it back out. Ultimately they need to learn to use the correct amount for the turn. For flying it doesn't make a difference, but in an emergency I would rather have a pilot that uses to little rudder on the turn to final, than to much. I'm assuming that 9 out of 10 pilots that don't yet fly a CT well are using to little rudder. I'm surprised there is even a concern in the other direction. I think this is just a teaching style and your reaction was on the strong side. All things being equal if the instruction to the student is to fly the approach at 1.3 Vso (52kts) on one hand or on the other the instruction is to 'just don't let your speed get below 52kts) one guy will learn to hit the number while the other guy learns to approach fast and float and fear slow speeds. In this case if you simply maintain a centered ball through-out the turn as opposed to 'just don't lead with rudder' you could end up with 1 student that can turn coordinated and one that's afraid to because its too close to a spin. The only way to get an abrupt nose down in a stall with out the spin entry would be from a whip stall. I'm confused by this statement. Are you saying with full flaps that there is always an incipient spin when the airplane abruptly noses down, except in the case of a whip stall? BTW, by "exceeding the flight envelope" I don't mean practicing stalls. Stalls are part of the flight envelope. I mean departing controlled flight or entering into a flight mode the pilot did not anticipate, due to inattention, poor technique, inexperience, or just "getting behind" the airplane. I'm confused by this statement. Are you saying with full flaps that there is always an incipient spin ﻿when the airplane abruptly noses down, except in the case of a whip stall? Another way to say it, if you use adequate right rudder to prevent the left spin entry it won't break without whip stalling. That's pretty much my experience, it just wants to mush unless I let it rotate left or pitch up 60*. Andy, in my experience when approaching a stall normally, and the nose abruptly breaks nose down there has always been rotation with the CT. Generally the nose lowers and the airplane is immediately back flying with no abrupt break. You can however get an abrupt nose down without rotation by using airspeed to pitch up aggressively before the stall, as in doing a whip stall. I was at Sebring working in the flight design booth when the CTLS was introduced in 2008. 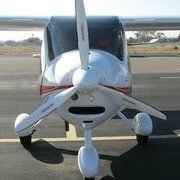 As a dealer and flight instructor I ask lots of questions about the changes. It was explained to me that when they did wind tunnel testing that there was no added benefit to flaps beyond 35°, and there was a decrease in control authority. At least that is how I remember it, it has been 11 years. My experience has been kind of opposite. If I approach normally, no matter the flap setting, the airplane breaks straight ahead, even if I go full back on the stick to get a sharper break. The only time I did get a wing drop was when I pitched up sharply before the stall break as you described. Doesn't it make more sense to get the rotation when the nose is higher due to torque and p-factor? Next time I fly I will do some tests to confirm what the behavior actually is in my airplane. That matches my experience...40° provides almost no benefit over 30°, maybe a knot or two slower stall and that's it. And the loss of control authority is definitely something that makes 40° flap landings harder. Andy, I have spun different airplanes through the years. As a CFI you also are required to have spin training. Both times I have seen a CT break hard the nose pitched down at least 60°, and speed quickly went past the flap speed for 40° flaps. It certainly wasn't the typical stall for a CT. Both times it happened was from a straight ahead power off stall with 40° flaps. The break and start of rotation seemed to happen faster than other aircraft I have spun, but part of that might be from the element of surprise. Tom, would I be correct in assuming that until that break there was a student at the controls and while you could observe stick input enough left rudder could have been added without you even knowing?